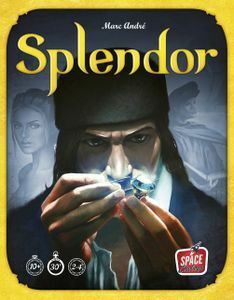 Buy Splendor and PriceWatch, Buy this board game at the Lowest Price. Splendor is considered a card drafting and a set collecting game. It plays 2-4 players, with 3 being the sweet spot, and only takes about 30 minutes to play. It ranks as the 81st best overall game, and 7th as a family game. The game takes place in the Renaissance era, and players are rich merchants who must utilize their resources to purchase mines, develop transportation, and recruit new artists to turn your gems into works of art. Though the theme is a great idea, I do not know if it is very deep. You do buy gems and then use the new gems to buy more permanent gems. But the buying mines, modes of shipping gems, and artisans can be completely ignored, they are really just art work on the cards. I choose cards for the gem on the card, not for the artwork. There are three levels of cards with each having a type of gem at the top. These gem cards can be purchased with gem tokens and then placed in the players display as permanent revenue, and use these values once every turn. Players are trying to gain the most prestige, this is done by buying gem cards that also provide prestige points and players can also gain points by attracting nobles with their gem displays. First player to 15 prestige points, triggers the end of the game. The game is set up by placing 4 cards from each of the 3 levels of cards out in a display (see below), with the remainder of the cards stacked by the corresponding levels. The tokens representing the different types of gems (5 gem types, and 1 wild gold) are also stacked by the game display. 5 Noble cards are drawn randomly and placed in the center with the other cards. Each turn players will be able to perform 1 of several actions. They can either take 2 like gems (only if there are at least 4 of that type), they can take 1 of 3 different gem types, they can purchase a card from the center using the necessary gems (these cards require different combinations of the different gem tokens) , or they can reserve a card for later play, and then also receive a wild gold token. Players will spend turns building revenue and then spending it. The aim is to create a display valuable enough to help purchase the cards with prestige points. Players will need to think ahead a little to ensure that they have collected the necessary gems to buy a card, as these are not limitless, and can easily become exhausted. Trying to buy a gem card and being 1 gem token away can be very frustrating. Every time a card is purchased a new card replaces it, until the level is exhausted. Strategy surrounds trying to create a permanent revenue that can later purchase more valuable cards, all while competing with other players for the same cards. I have seen different strategies win this. Some people try to save up and buy expensive cards containing prestige points right away; other people concentrate on their display and buy cards that attract nobles, and still others have won by buying the cheaper prestige cards. I have seen a 10 year old win and I have seen a 50 year old win, all this to say everyone has a chance. There is not much luck, besides the flipping of a new card helping an immediate player, because most players usually have a card in mind they are saving up for. The game is quick as previously mentioned, it has enough strategy to keep my attention, the art work is really beautiful, the cost is very affordable, and the replayability is virtually endless. All in all I would say every home should buy this, but especially if you have some wide age ranges you are playing with.